This ladies' fashion watch from Lorus features a rose gold case, a black leather strap, a sunray black dial, and rose gold sword hands and second hand. This watch is also splashproof. 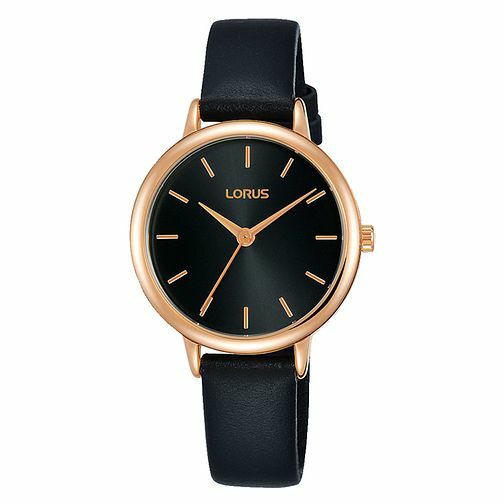 Lorus Ladies' Rose Gold Plated Black Leather Strap Watch is rated 4.5 out of 5 by 2. Rated 5 out of 5 by Anonymous from Attractive watch, good quality, love the rose gold Good quality, attractive, larger face than I would normally buy because I wanted an easier to read face but not bulky on my wrist. Pleased with purchase although next time I will probably buy a lighter coloured face which may be easier to read. Rated 4 out of 5 by Anonymous from Attractive, I an see it (getting older) and good value for money Attractive I can see it and good value for money. Also delivered to time.